All three Expression stompboxes are up for grabs! While most of us know Ernie Ball for its guitar strings and as the parent company of Music Man guitars, the company’s volume pedals took the world by storm and feature on a plethora of famous players’ boards, thanks to their smooth taper and rugged, road-ready design. Following on from the success of the range, the company has now revealed its Expression stompbox line, featuring an overdrive, tremolo and delay. Thanks to our friends at Ernie Ball’s UK distributor Strings & Things, you could win all three! Unlike standard stompboxes, the Expression Overdrive, Expression Tremolo and Ambient Delay all avoid footswitches, instead opting for a treadle to give you complete tonal and textural control. With a smooth-tapered overdrive control, the Expression Overdrive can deliver anything from natural, tube-amp break up to searing 80s lead tones with a near-effortless sweep. It also features settings for drive, tone and boost controls to ensure your dirt needs are catered for. The Expression Tremolo – resplendent in a fetching metallic purple – features five distinct waveforms, including square and harmonic, plus a vintage-inspired spring reverb to add ambience to your pulsating soundscapes. Last, but certainly not least, the Ambient Delay provides 50 milliseconds to one second of delay time, while also being layered with reverb, for everything from slapback to extended repeats. The effect level is fully controlled by the treadle for more textural integration. All three pedals feature a sleek, compact design that elevates your pedalboard’s cool points without occupying too much real estate. The competition closes 12am GMT, 10 January 2019. 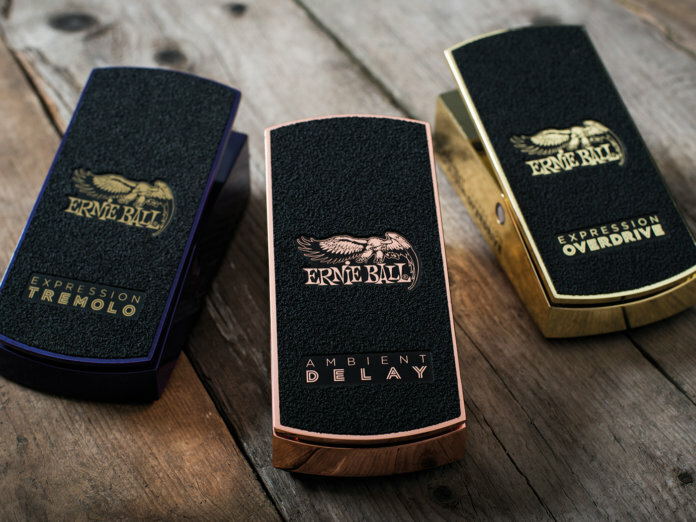 To find out more about Ernie Ball’s pedal range, head over to ernieball.com. The closing date is 12.00am GMT, 10 JANUARY 2019. The editor’s decision is final. The competition is open to UK residents only. When entering The Guitar Magazine competitions, you will be given the option to receive details of future promotions from BandLab UK Limited and related third parties. If you do not want to receive this information, you can opt out. This giveaway is open to over 18s only. For full terms and conditions, please go to bnd.la/gm-ctos.